SUSTAINABLE. ORGANIC. LOCAL. ETHICAL. THAT'S HOW WE ROLL. I’ll be the first to admit that the photos of this cake do not do it justice. I’m still working on my food photography skills and this one just didn’t work out. I’m hoping to make it again and hopefully get some better photos up. For now, you’ll have to trust me that this simple, one layer cake is freakin’ amazing. 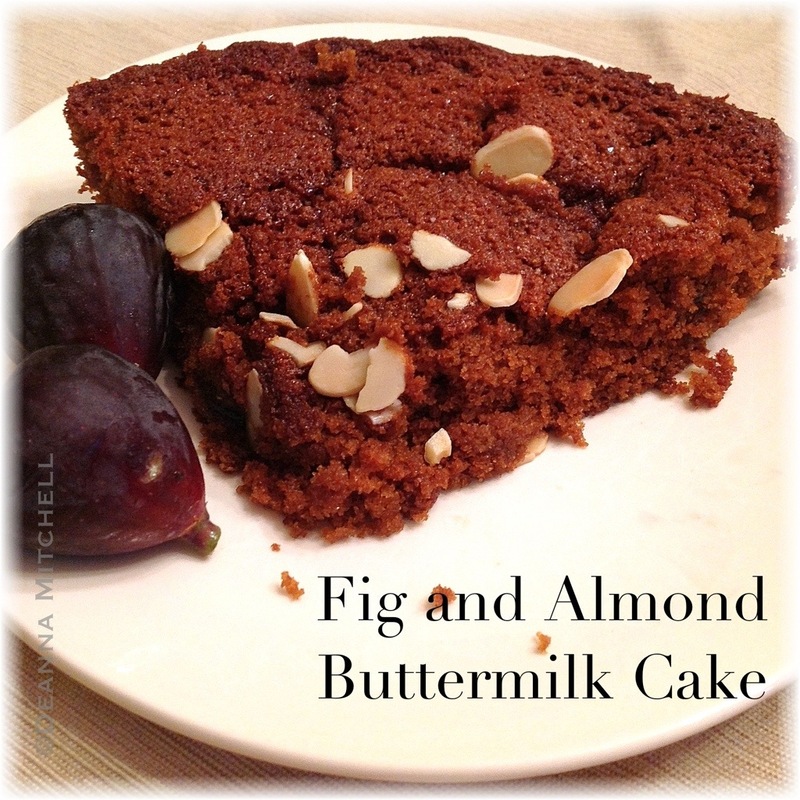 I used our buttermilk cake recipe from HERE and adapted it for a combination of figs and almonds. The resulting cake was incredibly moist, but light. The figs baked into the cake and almost melted. Wanting to try cake for breakfast? This is a good choice! This cake used whole wheat pastry flour and coconut sugar, making it much darker in color than it would be with all purpose flour and white cane sugar. If you haven’t tried coconut sugar yet, this would be a great recipe with which to start. Coconut sugar is a minimally processed sugar that is sustainably harvested from the sap of coconut trees. Unlike cane sugar or even brown sugar, coconut sugar is a low glycemic food (glycemic index of 35) that has 36 times the amount of iron as brown sugar and 16 amino acids. It is also high in potassium, magnesium, zinc, vitamin B1, B2, B3 and B6. It is considered safe to use for diabetics and can be used as a replacement for cane sugar in 1:1 ratio. Because it is very dark in color, your baking will also take on a rich, dark brown color, so keep that in mind. I don’t particularly care, but if you are baking a white cake, you’ll want to know that in advance. I dare you to open a bag of coconut sugar, take a deep inhale, and NOT fall in love. I. Dare. You. Grease and flour a 9″ round cake pan. Set aside. In a small mixing bowl, blend the first four ingredients. Set aside. In the bowl of a mixer, combine the softened butter and the sugar and beat well for about 2 minutes. Add the vanilla, almond extract and egg to the butter mixture and beat until blended. With the mixer on low, alternately add the flour and buttermilk, starting and ending with the flour. Mix until just blended. Add the batter to the pan, spreading evenly. Top with the fig halves and almond slices. Bake for 20 minutes, or until a toothpick poked in the center comes out clean. Cool cake in the pan for 10 minutes, then remove cake to a cooling rack to cool completely. Get a bit of SOLE in your email! Sign up today!